This morning, a table with white cloth and two chairs was placed in front of our tent and we were each presented with a foot-long baguette with beans inside and instant coffee. We packed up our tents, and I found these insects crawling over my tent. Here's Mr B's 65-year old Land Rover Defender. They used this to power the sound system that pumped out reggae music every hour of the day. We said goodbye to Mr B and Omar and got on the road. Good guys and very hospitable. 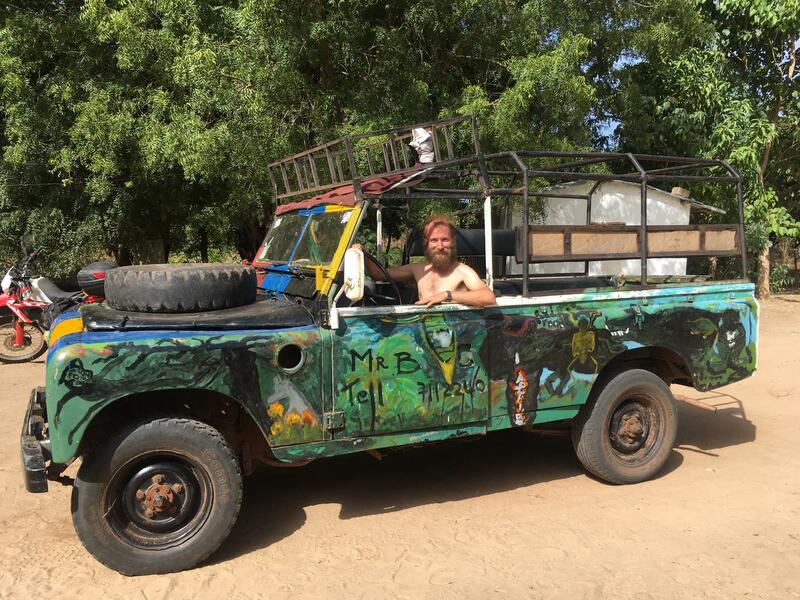 Mr B had invited us to stay for longer to join him at his sister's wedding and party later in the week; however, I was keen to get on the road after spending one week resting and partying in Dakar. 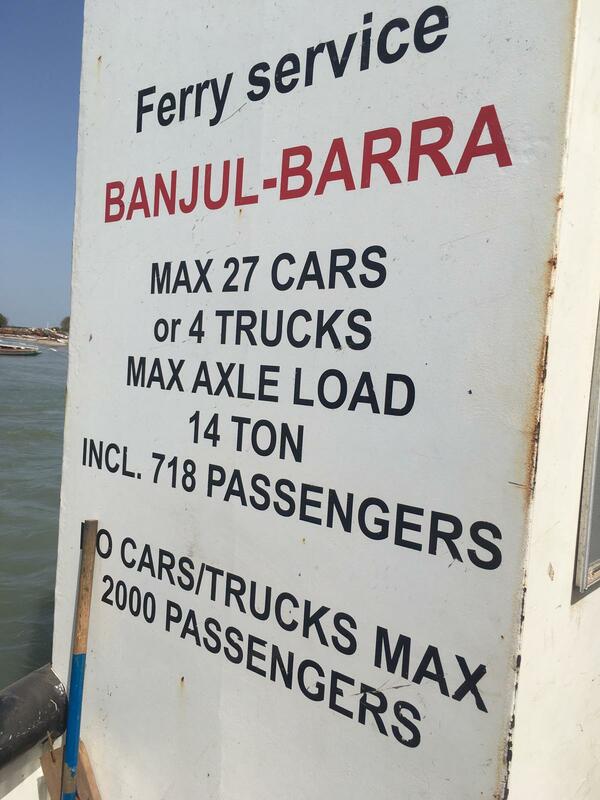 We road a short distance to Barra to catch the ferry to the capital, Banjul. 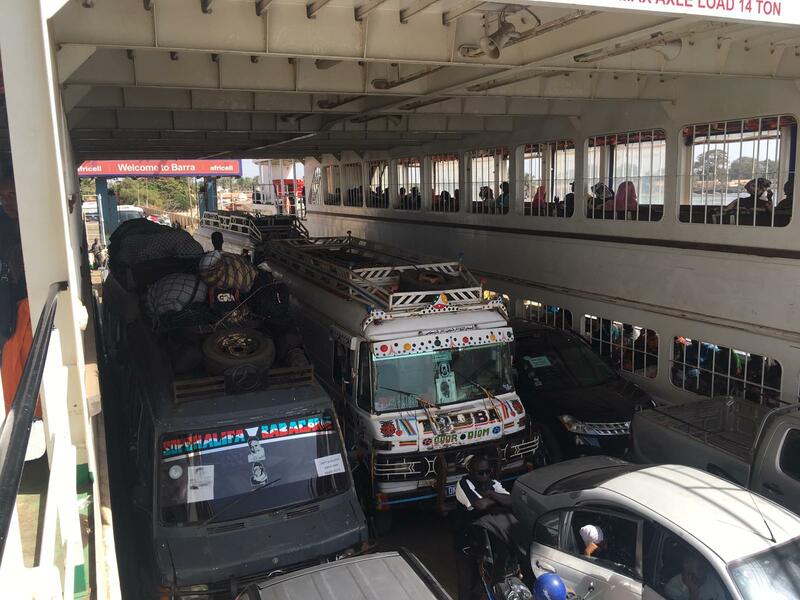 There was a dense queue leading to the ferry terminal and I became stuck between vehicles. A lorry to my side was pumping out diesel fumes close to me. 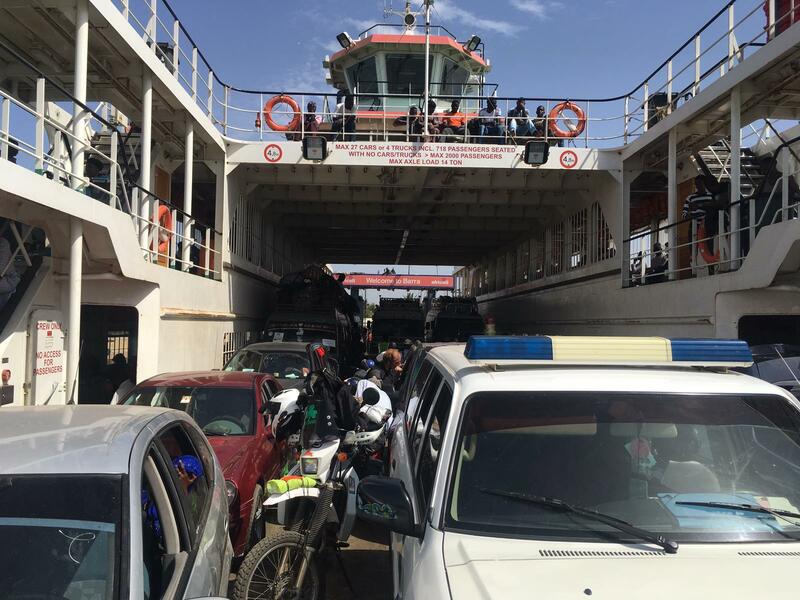 Arriving at the terminal, we had one unofficial guy helping us get tickets and get on the ferry who then asked for money. It was the same guy helping to guide us through the traffic. We'd just missed an opportunity to get through the main gate to where all vehicles were queued, so had to wait a bit longer. It was 35 C in my riding gear and without shade. I had mistakenly packed my top box key in my trousers in my pannier that morning, so couldn't access sun hat and also food. The gates eventually opened to allow more vehicles through. When the officials opened the gates, they had to push away people whilst I revved the engine a bit to signal I was coming through! We eventually got through the gates and found shade. In hindsight, the unofficial guy was keeping us back and making us wait so he could request money for getting us through. 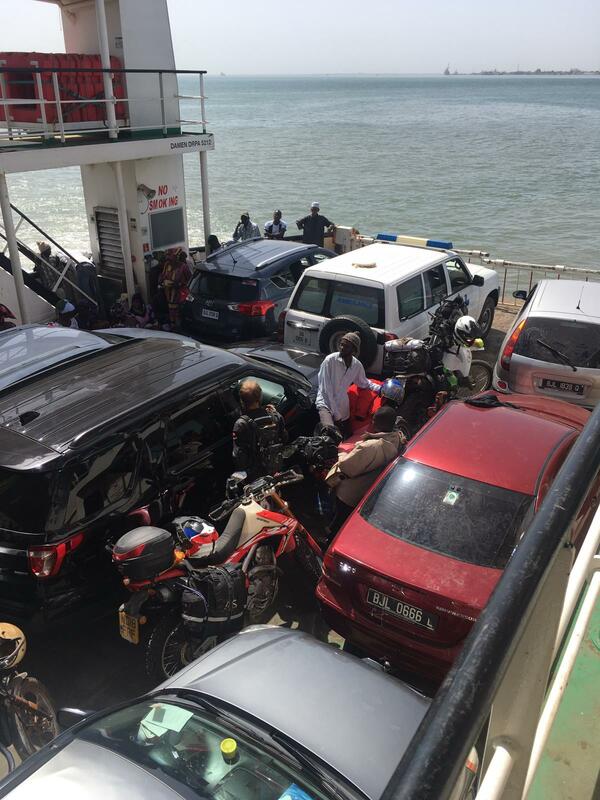 Vehicles and people were packed densely on the ferry. I sought refuge in a shaded area and got chatting to Karafa, policeman, and his friend from the fire and rescue department. Karafa's child was eating a fruit, so I asked what it was. He never said, but offered me one! It had a large stone with 2 mm of flesh under a shell. I ate it but sucking and scraping flesh off the stone with my teeth. Very tasty! I wanted to take a photo but it was so packed I could hardly move and there was a woman sleeping on my jacket! Here's some photos that Jonny took. 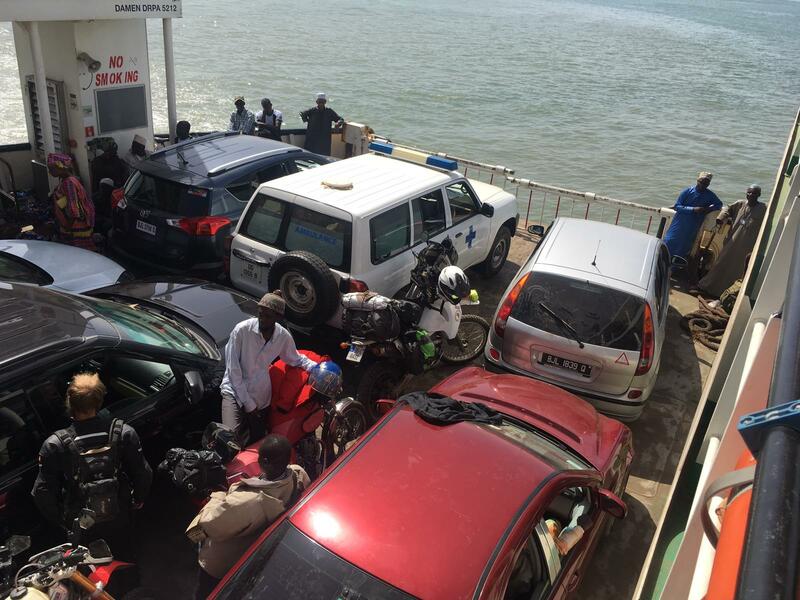 As we disembarked, there were two bikers at the front of the queue waiting to get on. They were a dutch couple living in The Gambia and they very kindly took this fantastic photo. Thank you Nathalie! We navigated the traffic and roads to a campground close to the city. After setting up my tent, I had a well needed cold shower!